Dishing it up! : Cupcake Friday!!! Once again it is Cupcake Friday! And I had everything ready to go except the pictures of the cupcakes. I put the flowers on the cupcakes last night before I went to bed and was planning to photograph them early this morning. Mother Nature, however, had other plans! We had a huge storm this morning with two incredible cracks of lightning and thunder. Results? No internet. OMG! No internet? Not only how was I going to post my edition of Cupcake Friday, but a day with no internet??? Cut off from civilization as we know it? No way. But wait! I'm babysitting this afternoon. A quick call confirmed that Virna has access at her house. Whew! That was close. 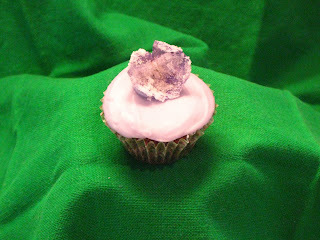 So better late than never, here is this week's Cupcake Friday...and is it a good one! I am just loving this cookbook. Soooo many cupcakes to choose from! I have bookmarked several pages for “must try” cupcakes. This week’s choice is one I’m really excited about! Every spring Bob gets the yard spruced up and plants our flowers. He fills the flowerboxes on the deck with gorgeous red and pink (big surprise there!) flowers. Pink for me of course, and red to attract the hummingbirds that I love so much. And then we plant my herbs. We have no yard to speak of, so we plant our herb garden in pots on the deck. They usually do quite well. One herb I absolutely adore is lavender. There have been years when I’ve planted three or four kinds. In the past I’ve used it to make lavender lemonade, lavender cookies, and lavender pound cake. So when I saw the Lavender-Iced Brownie Cupcakes on page 86 of Martha’s cupcake book, I immediately knew which cupcake won out for this week’s cupcake of the week! As I’ve said in the past, there are only two of us in the house. We still have cupcakes from last week that haven’t been eaten! (In all fairness, with Bob and Clint’s birthdays this past week, we’ve had cake, key lime pie, and cherry pie.) That many baked goods will do in even a sweet-lover like me! So I decided to make just half a batch. The recipe calls for dried lavender. I went out on the deck with my shears and snipped off three times that amount. When using fresh herbs in place of dried, use 3 times fresh as the amount called for of dried. Oh my goodness. When I chopped the lavender the kitchen filled up with its wonderful fragrance. When the milk was finished steeping with the lavender and I strained it, I then mixed it with the confectioners’ sugar and coloring. It was gorgeous! I couldn’t wait to put it all together. I did encounter one problem. I simply could not find edible flowers small enough for the cupcakes. Bob and I hunted at five different stores and called bakeries and florists. The florist I talked with said she could special order them. But it would take more time than I had. I figured I could come up with something. When Jane came over to relieve me of some of the remaining mocha cupcakes and saw this week's gems in the making, she was very interested. She is having a soirée tonight and called “dibs” on these for her dessert. I was just about to resort to making marzipan flowers when Bob spotted some beautiful purple wild geraniums in Jane’s perennial garden. A quick “Google” to find out these were edible flowers, and off we went with shears to Jane’s garden! (It’s dangerous living next door to us. Kind of like living next door to Edward Scissorhands!) But then again, it was fitting that the flowers on the cupcakes came from her garden since they were to be for her party! Yeah. Side note: Sugaring wild geraniums is a bite. They are so delicate and the petals are so very thin that even superfine sugar weighs them down. My genius husband came up with a solution! We used simple syrup to "paint" them and then sprinkled the superfine sugar on them. Lots of painstaking work, but in the end they did turn out cute as buttons. Hope the ladies at Jane’s party enjoy them! 1. Preheat oven to 350°F. Line standard muffin tins with paper liners. Whisk together flour, baking powder, and salt. Melt butter and chocolate in a heatproof bowl set over (not in) a pan of simmering water; stir until smooth. Remove from heat, and let cool slightly. 2. With an electric mixer on medium speed, beat chocolate mixture and sugar until combined. Add eggs, one at a time, beating until each is incorporated, scraping down side of bowl as needed. Beat in vanilla. Reduce speed to low. Add flour mixture and beat until just combined. 3. Divide batter evenly among lined cups, filling each two-thirds full. Bake, rotating tins halfway through, until a cake tester inserted in centers comes out clean. About 17 minutes (cupcakes will not be domed). Transfer to wire racks to cool completely. 4. To finish, use a small spoon to coat cupcakes with icing, covering tops completely. Let set, about 1 hour. Top with crystallized flowers. Iced cupcakes can be stored up to 2 days at room temperature in airtight containers. Bring milk and lavender just to a boil in a saucepan. Remove from heat, and cover; let steep 10 minutes. Strain through a fine sieve into a bowl, and discard lavender. Whisk in confectioners’ sugar until smooth. Strain again. Add food color, a little at a time, stirring until desired shade is achieved. Use immediately. Whisk egg white with the water in a small bowl. Working with 1 flower at a time and holding it with kitchen tweezers, brush egg wash over entire surface of flower using a small paintbrush. Sprinkle with superfine sugar to coat completely. Transfer to a baking sheet or wire rack; let set. Crystallized flowers can be stored up to 3 months at room temperature, in single layers between waxed paper, in airtight container. Wow - you are amazing! These look great! I just want to say that I am the lucky person who lives next door to Jean Bugs. 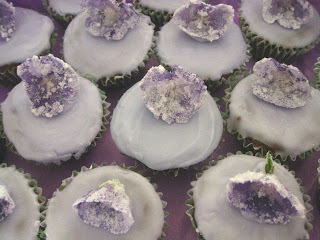 I got to serve these lovely little Lavender Iced Brownie Cupcakes at my party, thanks to Jean. The lavender and chocolate are sooooo complimentary of each other. They received rave reviews from everyone at the party. I now have offered to make these for my niece's bridal shower. I doubt if they will look as beautiful as Jean's, but I'm going to give it a try. Besides with Jean next door I can always yell for help! !